Cumberland Bank & Trust - A customer service-oriented community bank, serving Montgomery County & Clarksville, Tennessee. What Type is Right for You? EMV Chip Cards are officially here! 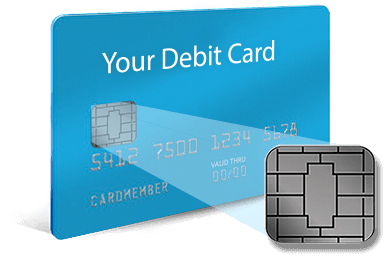 As we continue to provide superior customer service along with the best banking services available, we will be replacing your traditional magnetic strip card with an EMV Chip Card within the next six weeks! You will have your new Chip Card in time for Holiday shopping. Continue to use your current card until you receive your new Chip Card in the mail. When switching to chip technology, all Chip Cards are issued with a new card number. It’s the secure way to make purchases at chip-card terminals in the US and abroad. technology to protect your account information, reduce the risk of fraud, and make your card difficult to counterfeit. Chip cards are already standard in more than 130 countries — and US merchants are quickly switching to chip — so your card can help you make more secure purchases practically anywhere you go. You’ll sign for your purchases at most check-out counters, and use your PIN at self-service terminals. Create your 4-digit PIN when you activate your card. It’s simple! Just swipe and sign as you always have. (There’s also no change for online and phone purchases.) Remember, since US merchants are quickly making the switch to chip cards, you’ll use your magnetic stripe less often as time goes by. Flexibility is a wonderful thing. online banking We are excited to announce a new and improved Online Banking system with new features and enhanced functionality. This new Online Banking system delivers the power and convenience you need to manage your money more quickly, easily, and securely than ever before. EMV Chip Cards Now offering Chip Cards, it’s the secure way to make purchases at chip-card terminals in the US and abroad. locations Find a branch location convenient to you. We have six locations in Clarksville. contact us Have a question you couldn’t find an answer for on the site? Visit our contact page to get in touch with us. We are happy to answer your questions! ©2019 Cumberland Bank & Trust Website Designed & Developed by Thrive Creative Group, LLC. ©2019 Cumberland Bank & Trust  Website Designed & Developed by Thrive Creative Group, LLC.